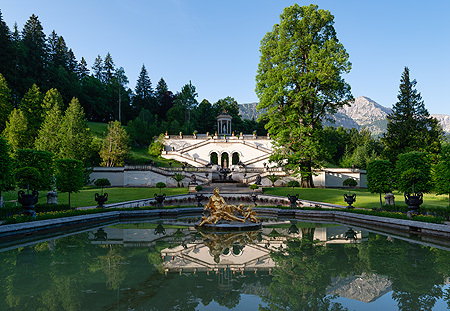 The Linderhof Palace park is among the most outstanding of its era. It combines elements of the French Baroque garden and the English landscape garden. The terraces on the central and horizontal axes of the palace with their water basins and geometric flower beds, the long cascade with its elaborate fountains and the two focal points, the pavilion and the Venus Temple, are Baroque motifs. The natural, irregular design of the surrounding park with the exotic buildings is based on English models. The Moroccan House and Moorish Kiosk are examples of the Oriental trend that was also cultivated by Ludwig II. The three "stage sets" in the park, Hunding’s Hut, the Hermitage of Gurnemanz and the Venus Grotto, stem from Ludwig’s enthusiasm for the operas of Richard Wagner. The mountain backdrop is incorporated into this brilliant synthesis of the arts by means of visual axes and kilometres of paths which lead far up into the mountain forest.